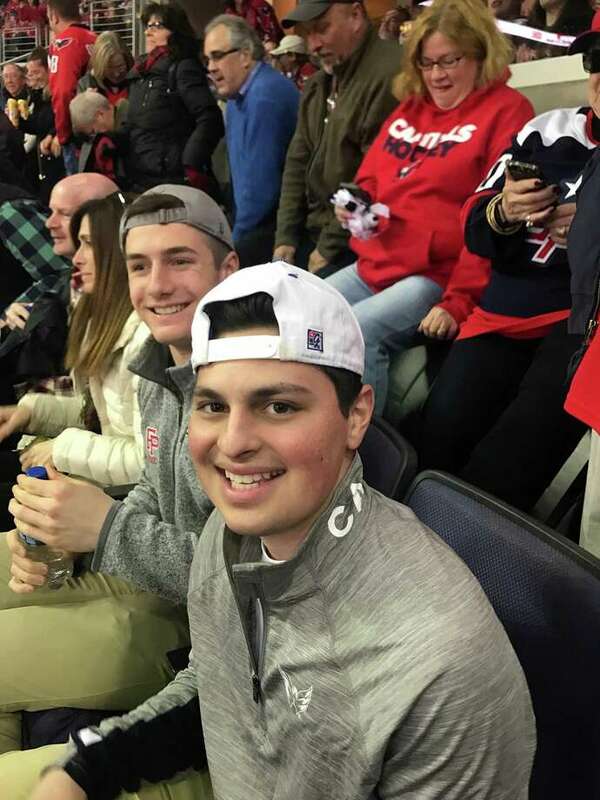 Former Fairfield co-op goalie Charlie Capalbo, diagnosed with cancer just over a year ago, continues to fight the disease. Recently, he enjoyed attending a Bridgeport Sound Tigers game. FAIRFIELD - “I want to show you something,” Charlie Capalbo is saying as he starts to roll up one of the sleeves on his T-shirt. But before he finishes the grand unveiling, you can’t help but notice Charlie’s smile. It’s big, it’s genuine, it’s emotional. For someone that’s gone though what Charlie has gone through over the past year, that smile is a sight to behold. “What do you think?” he asks as he reveals a large, gold ribbon tattoo - gold is the color for pediatric cancer patients - with the year 2017 inscribed on it. A second year, 2020, will be added when all is said and done with his treatments. A year ago, a tattoo would have been unthinkable. Honestly, even now, the risks involved in getting it were large. There could have been an infection or poisoning from the ink, but Charlie wanted it. He needed to document the road he’s traveled from last year until now. And he was going to keep asking until the doctors finally relented. They did. Charlie’s mom, Jennifer, said that the nurse kept trying to talk him out of the thought. It’s been about 15 months since Charlie and the Capalbo’s world was turned upside down with the diagnosis that Charlie had non-Hodgkin lymphoblastic lymphoma T-cell Stage 3 cancer. A tumor the size of a softball was lodged between Charlie’s heart and his left lung. It was inoperable. That was March of 2017. It was about a month earlier when Capalbo - the starting senior goalie for the Fairfield co-op boys’ hockey team - started feeling under the weather. He thought it was the flu and battled through it over the next couple of weeks as the Mustangs played in both the FCIAC and CIAC tournaments. In a 5-4 overtime loss to Greenwich in the FCIAC tournament, he made 32 saves. In the Division I tournament, a 5-2 loss to West Haven, he stopped 27 shots. All with a tumor growing in his chest. Visits to walk-in clinics and the family physician provided little answers and little relief and when chest X-rays and blood work finally revealed the tumor, Capalbo was racing to the ICU at Yale-New Haven Hospital. First came a 28-day treatment phase called 'induction.' Next, another 28-day treatment phase called 'consolidation.' Then, a third phase 'intermaintinence' took place. That phase had Capalbo in and out of the hospital, several times fighting for his life. Eventually, the doctors found better acting medications that have allowed Capalbo to slowly - very, very slowly - get back to trying to become a ‘normal’ kid. “I’m almost there (normal). I wouldn’t say ‘normal’ yet but you can see the light,” he said. “You know it’s almost there, it’s coming. I still have these chemo pills that I have to take every day, it’s like 20 pills a day ... these pills, you can’t eat an hour before and two hours after and I love to eat. It’s horrible that I can’t eat for three hours. It was discovered that Charlie’s platelets were too low, so he had to have a blood transfusion. Once at 140 pounds, he’s lost about six pounds and has been tired and appetite inconsistent. The good news, however, is the chest X-ray showed no evidence of the tumor. Recently, Charlie has been feeling pretty good as his doctors continue to try and find just the right dose of his daily chemo pills. The original dose proved to be too much and Charlie had been pretty sick but the doctors have downgraded his medicines to 75 percent of its original dose with the hope that will do the trick. In continuing to work toward that ‘normal’ routine, in the spring, Charlie took a micro-economics class at Fairfield University this spring. “I warned him,” Jennifer said. This fall, Charlie will head up South Benson Road to attend Fairfield full-time. Along with the micro-economics class, Charlie has gotten back on the ice and staked, he went skiing for the first time at Butternut Basin and attended a Sound Tigers hockey game. This summer there are plans to vacation at Block Island, visit a friend at UCLA and see Bruce Springsteen. To see him this happy and active, despite the occasional setback, it’s almost surreal to his father, Anthony. Said Jennifer: “It’s hard to put into words … I come downstairs sometimes, and I see him and it’s hard not to go overboard with love. I want to hug him all the time. There are times when he leaves the house and Anthony and I will look at each other and go, ‘Can you believe it?’ Just how far he’s come and how many times we thought he might not ever get to this point. On May 24, Charlie celebrated his 20th birthday with his favorite meal, French Toast. Charlie flashes that big smile. No, that will never get old.